Sweden's northernmost city and home to around 20,000 people, Kiruna is located in the Lappland province and has gained recognition as the closest city to Jukkasjärvi, the location of the world-famous Ice Hotel which is perched on the edge of the Torne River and attracts thousands of tourists from across the world each year. 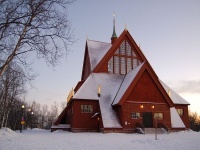 Kiruna is also famed for its Neo-Gothic church, which was built in 1912 and is one of Sweden's largest wooden buildings, even voted the country's best looking church. What was once a sleepy mining town has now become a bustling hive of activity during the winter months, when Kiruna hosts the annual Snow Festival, and although the city's population has not grown dramatically over the last few decades, it still sees throngs of travellers and tourists passing through each year to enjoy the festivities of the Snow Festival, the annual summer Kiruna Festival and, of course, the famous Ice Hotel in Jukkasjärvi. Located 124 miles (200km) inside the Arctic Circle and seven and a half miles (12km) from Kiruna Airport, the amazing Ice Hotel was first opened in 1990. The hotel is built anew each year, usually around mid-November, when ice is collected from the Torne River and moulded into magnificent bricks, sculptures, ice furniture and even a bar with ice glasses! The Ice Hotel is open to day visitors throughout the winter season. In Kiruna and the surrounding countryside visitors can enjoy winter activities like dog-sledding, hunting, and experiencing the local Sami culture. Kiruna is also one of the best places in Sweden to see the Northern Lights. Summer in Kiruna offers a host of outdoor activities, including hiking, canoeing, river-rafting, cave exploration, and expeditions to view the famous Midnight Sun. We are looking for contributors for our Kiruna travel guide. If you are a local, a regular traveller to Kiruna or a travel professional with time to contribute and answer occasional forum questions, please contact us.